Carl Fogarty was undoubtedly the king of World Superbikes (especially at Assen) and made it as popular as ever, increasing public awareness as a result of his four world titles. 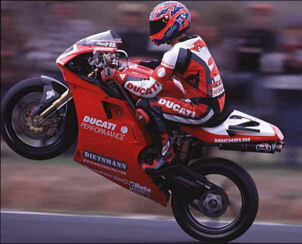 His accident in 2000 at Philip Island was a trajedy that broke a lot of WSB fans hearts. His domiance of the series meant that no one could touch him, his drive, determination and fignting spirit have inspired a lot of riders. It would have been great to see him compete in the MotoGP's but sadly it wasn't to be. However, his short fuse and arrogance made him many enemies, but he didn't care, winning was his sole objective. If he couldn't win, he would probably rather crash. A true legend that many WSB fans will be hard to forget.